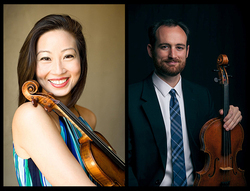 NACOGDOCHES, Texas - Guest artists Ching-Yi Lin and Andrew Braddock will perform music for violin and viola in a recital at 7:30 p.m. Sunday, Feb. 11, in Cole Concert Hall on the campus of Stephen F. Austin State University. The concert will feature primarily duets for violin and viola, as well as a solo work for violin, according to Dr. Jennifer Dalmas, professor of violin in the SFA School of Music. The program includes Violin and Viola Duo No. 1 in G major by Wolfgang Amadeus Mozart; Three Caprices by Michael Alec Rose; Violin Solo, Op. 27 Ballade by Eugène Ysaÿe; and Three Madrigals by Bohuslav Martinu. The first, second and last pieces are duets for violin and viola, Dalmas explained. "The Mozart duet, composed in 1783, features the two instruments quite equally and is a staple in the violin-viola repertoire," she said. The Ysaÿe Sonata No. 3 is from a set of six sonatas that Ysaÿe wrote, each dedicated to a different great violinist of the day. This one, the "Ballade" is dedicated to the Romanian composer and violinist Enescu, who later taught Yehudi Menuhin. The Three Madrigals by Czech composer Martinu is one of the most well-known and frequently performed 20th century compositions for violin and viola duet. "Inspired in part by the Mozart duets, the piece also shows the influence of the English Madrigal, for which the composition is named," Dalmas said. Lin is associate professor of violin and director of the Pre-College Strings Program at Western Kentucky University. Recent performances and master classes have taken her to the Barratt Due Institute of Music in Norway, Shenyang and Xi'an Conservatories in China, Northwestern University, the University of British Columbia, and Louisiana State University. During the summer months, Lin serves on the faculty at the Indiana University (IU) Summer String Academy and WKU Summer String Institute, and she has also served on the faculty of the Sommersymfoni i Kristiansand in Norway and University of North Texas Summer String Institute in Texas. Braddock is currently on the faculty of Western Kentucky University and its Pre-College Strings Program. He teaches viola at the university and maintains a full pre-college studio of young violinists and violists. He also serves as the director of the Summer String Institute. In addition to his many recital performances in the Kentucky area, Braddock has performed in Israel, Austria, Indiana, New York and Colorado. He is the principal violist of the Paducah Symphony Orchestra, and he has been a member of the Evansville Philharmonic and Owensboro Symphony Orchestras. The guest artists will teach a master class, which is free and open to the public, at 2 p.m. that day in the Music Recital Hall, located in Wright Music Building.